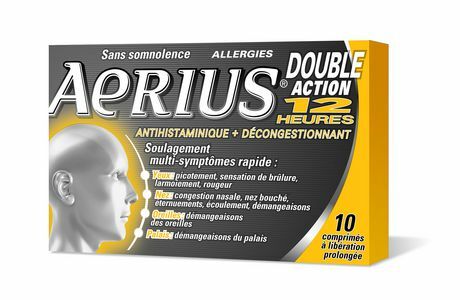 AERIUS® Dual Action 12 Hour is a formulation designed for relief from nasal congestion and symptoms caused by seasonal allergies for up to 12 hours. 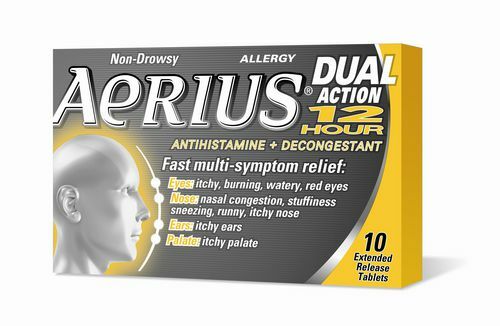 AERIUS® Dual Action 12 Hour relieves all of the following allergy symptoms: nasal congestion or stuffiness; sneezing; runny nose; itchy nose; itchy ears; itchy palate; itchy, burning, watery, red eyes. AERIUS® Dual Action does not cause drowsiness. To make sure AERIUS® is right for you, always read and follow the label. ® Registered trademark of MSD International Holdings GmbH. Used under license. © 2014 Schering-Plough Canada Inc., a subsidiary of Merck & Co., Inc. All rights reserved.